But it's out now. So if you want to hear me talk about poetry (and really, who doesn't? 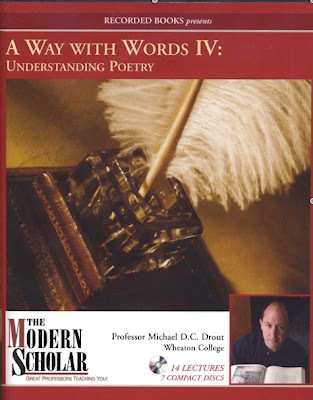 ), you can get the course directly from Recorded books and listen to me make fun of the emo parts of "Ode to the West Wind." The other courses in the series are also available from Recorded Books and from audible.com. (Joking aside, I'm pretty happy with the way the course came out. I recorded another one, The Anglo-Saxon World, in December and that should be out in the early spring). Anglo-Saxon Aloud wins an award. Over at The Ruminate, Larry Swain created the PEAA Awards (Praemium Ephemeridis Aetheriae Auctoribus awards [Award for Authors of Ethereal Diaries]), and he recently announced that Anglo-Saxon Aloud won for Best Podcast on Medieval Subject. This award is incredibly gratifying, because it comes from the people who know best (the medievalist blogging community), and I really appreciate the award and Larry's putting together the whole thing. Of course it is a little ironic that I got the award just as I got too much of a cold to effectively finish up the poetry. The entire ASPR is recorded and posted, but there are a few other short poems (well, except Instructions for Christians, which is a beast). As soon as my voice no longer sounds like I have smallish bees up my nose, I'll finish that up and then try some prose. So thanks to Larry, to those who voted for Anglo-Saxon Aloud, and most importantly, for those who listen to Anglo-Saxon Aloud. Knowing that there are listeners, all over the world it turns out, has been the biggest motivator for my keeping up with the project, and the project itself has taught me an enormous amount about Anglo-Saxon poetry. Hippos Go Berserk is a Forgery! The following information is so explosive that I just couldn't wait for the Speculum article to come out. I have evidence that Hippos Go Berserk, allegedly by Sandra Boynton, is likely a crude forgery that has duped generations of scholars. 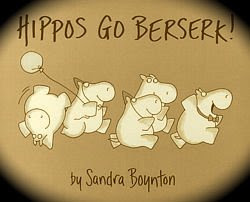 A close-minded critical establishment dominated by a line of Oxford and Cambridge Professors has refused to acknowledge that Hippos Go Berserk contains inconsistencies that the real Sandra Boynton would never have included in a work. Leave six hippos quite distressed. With four hippos headed north. The last two hippos go their way. One hippo, alone once more, misses the other forty-four. See it? See the problem? The six hippos who were quite distressed NEVER LEFT. They are still there. So the final hippo is NOT alone, missing the other forty-four: He's with six hippos, and the seven of them are (perhaps) missing the other thirty-eight hippos. If the version we have of Hippos Go Berserk were actually by Sandra Boynton, this inconsistency would never have occurred. Therefore Hippos Go Berserk is a later forgery, not actually by the great Boynton, and thus the entire edifice of scholarship built upon the assumption that Hippos Go Berserk is genuine needs to be demolished. The "six hippos who never leave" inconsistency and others (for example: the fuzzy blue animal at the beginning of the book is at one point called "a guest" and at another, "a beast") suggest a writer who is trying to imitate Boynton from a different point in time. We will, to be cautious, call this writer Pseudo-Boynton, but it is likely that the forger is the only writer of the tenth century who had the ability even to attempt to forge Boynton's unique style. The true author of our version of Hippos Go Berserk is thus none other than . . . Byrhtferth of Ramsey! I meant to blog about this last week, but I had to get a lot of other stuff finished before the semester started. Recently a research group at Johns Hopkins announced some results at getting DNA out of manuscripts. Jonathan Jarrett blogged about it here. This isn't my crazy Sheep DNA project, which got started back in 2005 after Scott McLemee sent around a meme on Inside Higer Ed and I responded. I may have spread the idea to the internet in 2005, but it was not mine, originally. Greg Rose came up with it in a conversation with me in the fall of 2001 (though of course he may have thought of it earlier). And other people seem to have had the idea independently. Supposedly (though I can no longer find the link), a group at Cambridge tried to sequence the DNA out of some manuscripts in the Parker Library. In 2007 I was able to get some funding for the project, which is why I was able to get started and give a report here. With Prof. Barbara Brennessel (my co-author in the Anglo-Saxon medicine paper) and our student, Amanda Shorette, we started laying the foundation for the project. I taught Amanda paleography so that she could understand the ways that humanistic researchers work, and she researched and then taught me about DNA extraction and PCR (Polymerase Chain Reaction) amplification of DNA. Amanda did a lot of very good research to show what we could and could not do with ovine DNA. Then this fall another student, Jay Korzun, was able to extract DNA from a fragment of manuscript. We didn't go to press or publicize this yet because we have been consistently worried about cross-contamination and are trying to rule that out, but it seems we are basically at the same place as the Hopkins group. Here's the problem, which, word has it, the Cambridge group also ran into: when you have about 1000 years worth of touching and rubbing along the edges of books, you end up with a lot of DNA cross-contamination, not just from human DNA that has rubbed off (which you can rule out by using different primers), but from the various leaves bound together in the manuscript (for example, if someone touches leaf 42r and then touches leaf 45v, particles of DNA from one can be transferred to the other). Again, rumor has it that the Cambridge group concluded that you would have to cut out a few square centimeters out of the middle of each leaf in order to avoid contamination as much as possible. Librarians were not enthusiastic. All these problems don't make the project impossible (maybe), just very difficult. I have been working on a patent application for a process/device to get samples in a non-destructive manner (i.e., get microscopic samples; there is no non-destructive way to get DNA out of a manuscript -- swabbing doesn't get you enough, we learned), but even if that works (and working on it as a patent isn't meant to keep anyone from using it; it's meant to keep anyone else from patenting it and then stopping me from using it), we will still have a very, very messy data set. But, as I've learned from the lexomics project, messy data can be dealt with if there is enough of it. So the key is to get data from a huge number of manuscript leaves and try to weed out the cross-contamination. To that end, we've concluded that we're going to need to take a bioinformatic approach, and figure out as much of the ACTG etc. coding of the DNA we extract. 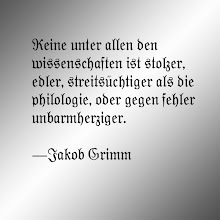 Then all of those codes, as fragmentary or complete as they are, go into a massive database, to which other researchers can contribute. Eventually we will be able to start building some phylogenetic trees. So, to those who've asked: no, I'm not upset at the Hopkins group, who almost certainly came to the idea independently. The only way this will ever give us interesting results (i.e., Fred the Sheep gave his life for the Beowulf manuscript and look, part of Fred is in the Blickling homily manuscript also; or Fred's cousin Violet is in this Malmesbury charter...) is if a very large number of researchers and groups gather data over a long period of time, so there more people working, the better. The studio had told me that it would only take two weeks, but it was more like a month (the holidays probably did get in the way a bit), but now I have copies of Beowulf Aloud in stock again ("the Tickle Me Elmo of 2008"). If you'd like to have your own personal copy of the 3-CD set of the greatest poem in Old English, filled with monster fights, dynastic politics and, most importantly, beautiful poetry, you can order it here. or use PayPal Button below (for domestic US shipping only; contact me m drout at wheaton ma dot edu for information about overseas shipping). This is a paraphrase of a conversation at a meeting. Background: Wheaton has arranged for a sophomore January experience. Sophomores come two days early and do some stuff. This happens to be on the day of the inauguration, so the planners decided that all the sophomores could be brought to the field house where they would watch the ceremony on a giant screen. Drout: (as tactful and politically savvy as I always am): I'm just glad I never had to participate in such a creepy experience when I was in college. X: (confused): Why would you call it creepy? Drout: You are rounding up a large group of people and forcing them to watch political theater. On a giant screen. In a gymnasium. Drout: It never occurred to any of you who planned this that it was the slightest bit creepy, did it? X: The way you describe it makes it sound creepy. It is a major event that most people will want to watch. Drout: Couldn't they watch it without being herded together into a gymnasium? Maybe hang out with their friends, watch it on the various lounge TVs? Make comments? X: But then there wouldn't be the bonding experience. Drout: Bonding over a political spectacle is, in your view, a good thing? X: Maybe you should be one of the faculty members afterwards who can give talks to contextualize the event. You could analyze the rhetoric. Drout: I'm pretty sure I don't want the students to see me as part of the creepy event. X: But you'd have a chance to express your point of view. Drout: But you've got my entire point of view. I think it's creepy. X: (Gives up in exasperation). [Clarification: I am not suggesting that watching the inauguration is creepy. It's a major national event and it makes sense for people to watch it (although I was too busy working, I may watch the speech on YouTube later). I am creeped out by the leadership of the college putting together a program where students are pressured to go to watch a piece of political theater on a giant telescreen in a gymnasium. And I thought it amusing that a group of Ph.D.s didn't immediately spot the Orwellian imagery. My only political comment, since I didn't vote for President Obama or his opponent or his predecessor, or his predecessor's predecessor, or his predecessor (this wasn't just a joke) is that it is more important to be skeptical, cynical and on your guard when your guy wins the election than when the other guy does (Likewise, you should read Dune Messiah and not just stop with Dune). My colleagues were very effective at being critical of the rhetoric, etc., of the previous administration. They should keep up the good work. Alleluia! The Psalms are Done! Psalm 149 and Psalm 150 went up today, which is perhaps appropriate. I certainly feel like praising, as I am very glad not to be doing Psalms any more. I started with the sung version of Psalm 51 on April 17 and have thus been recording Psalms for nearly nine months! I am rather in awe of those who memorized and sung the Psalter, particularly those who did not understand Latin but sung it anyway. So the entire ASPR is now available. I'll be tying up loose ends over the next two weeks and then poetic side of Anglo-Saxon Aloud will be, for the time being, complete. Apologies for my absence from the internet world. Just before Christmas I recorded a new course for Recorded Books (The Anglo-Saxon World) and am now finishing writing the course book and, with the holidays and family life, I had to put other things on hold for a while. But now it's back-to-work time. I've finished recording the final ten Psalms in the Paris Psalter and will be posting them, two per day, for the rest of this week, so by Friday recordings of the entire Anglo-Saxon Poetic Records will be on line except for the whole of Beowulf, which for economic reasons is only up in a few select pieced ("economic reasons"= I had to pay a lot for studio time to record it, so I sell the complete Beowulf at here at Beowulf Aloud). Now it's time to tie up some loose ends. I'm going to go back and re-record the Psalms that I sung instead of recited (Psalms 50-68) and have both versions, spoken and sung, up on the site. That will be next week's project. And then I want to put up those remaining poems that are not in the Anglo-Saxon Poetic Records. I want to make sure that I have a complete list (and texts), so I'm using the Dictionary of Old English corpus to look for anything in the Verse category that I haven't recorded. Here's what I came up with so far. Is there anything missing? With a little luck, I will manage to get the re-done Psalms (50-68) and these miscellaneous poems all recorded, edited and posted before the 2-year anniversary of Anglo-Saxon Aloud on February 21 (I thought it would take about a year to do the whole project, and I'd like to not be wrong by a full factor of two). Once the podcasts are all finished, I will be working to put the whole thing together on a CD-set, an iPod shuffle, or a memory stick for those who want to own a complete copy rather than doing two years of downloading. In the meanwhile, you can get the 2-CD set of Anglo-Saxon Aloud: Greatest Hits (which also has modern English translations and brief commentaries) at the link.